I may be living in the frozen north but right now my mind has traveled to the south, specifically Louisiana. I've been bitten by the Mardi Gras bug! Having visited New Orleans in October I got a feel of the energy of the city. If it was that lively in October I can only imagine what it's like now that it's Mardi Gras time...probably a bit too much energy for me!! A number of years ago, when we were both teaching at a knitting event, I met with a wonderful lady from New Orleans who also happens to be a fabulous designer. Jackie E-S created a pattern for a knitted "Stress Ball" that evolved into a large Mardi Gras Ball. Sometimes you just need to take a break from practical knitting and knit something whimsical, so I ordered the pattern. I've decided that I'll make one ball a year, each one to be different than the others, until I have enough to fill a decorative bowl. 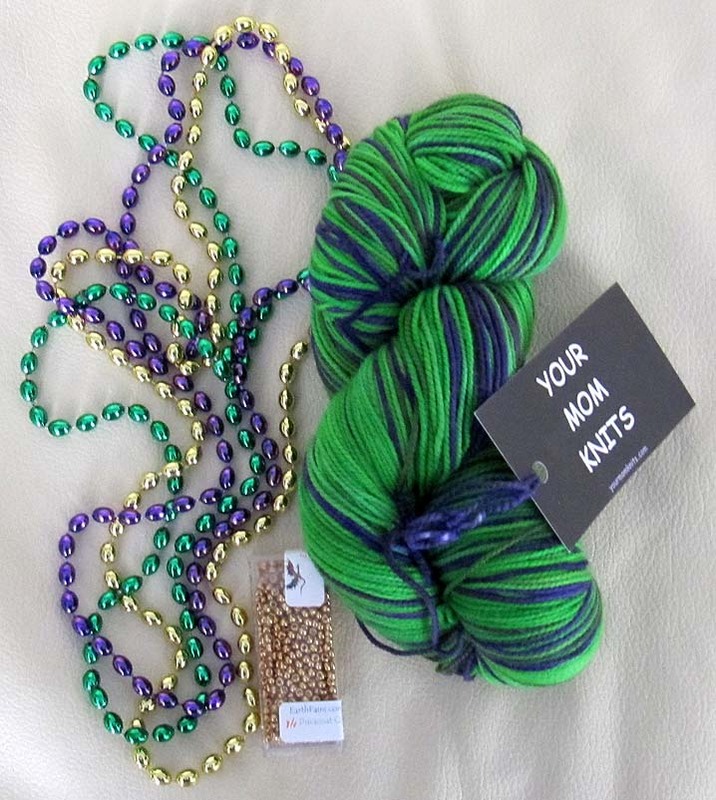 I have the same yarn that Jackie used for hers, a skein of Lorna's Laces sock yarn in a color called Funky Stripe. (I don't know if it's a currently dyed color as I don't see it listed on the Lorna's Laces site - Jackie has kits, click here). I think I'll save that one for next year as I came across another yarn that spoke to me for now. The color is called Sour Grapes and is from Your Mom Knits, a shop on Etsy. The colors of Mardi Gras are purple (justice), green (faith) and gold (power) and this yarn has two of the three colors. The addition of the 8/0 gold beads from EarthFaire rounds out the combination. I won't have the first ball done in time for Mardi Gras this year. My goal is to have it ready for 2014, at which time, I'll start the second one. I'm drawn to all the bright colors.